In this example, we want to show off the very basics of a multiple find request search. We have 3 buttons for scripted searches. The first two buttons are single request searches. The last button is a multiple find request search. 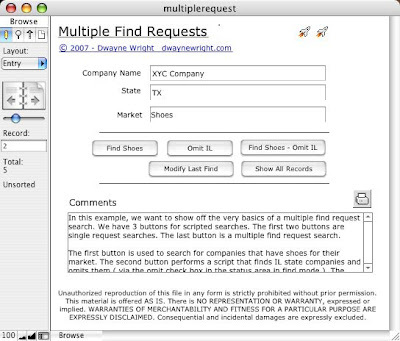 The first button is used to search for companies that have shoes for their market. The second button performs a script that finds IL state companies and omits them ( via the omit check box in the status area in find mode ). The third button performs the first find and then has a second find request. This requests omits the IL companies from the first find request. So we are finding shoes market but not allowing the IL companies into the final found set. You can view each of the find request settings by clicking the Modify Last Find button after you run the find. The Modify Last Find action will return you back to your find settings while you were in find mode. The Show All Records button shows all the records in the found set.